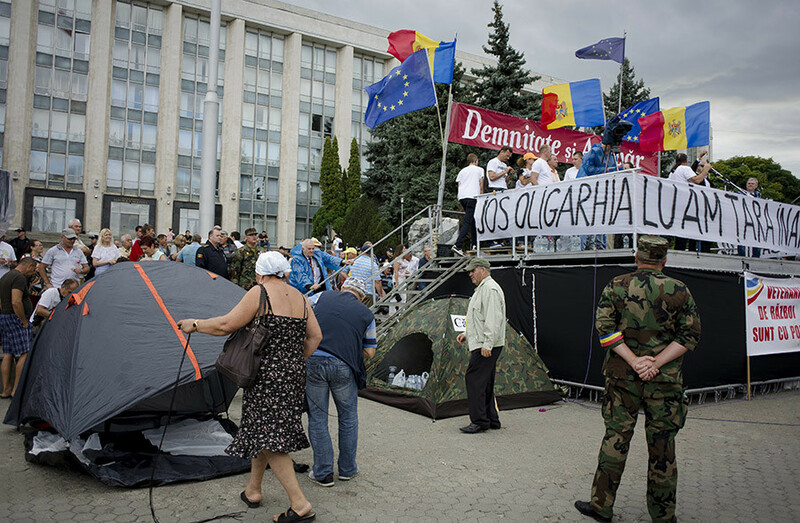 Protesters have set up tents outside the government building in the Moldovan capital of Chisinau, following a demonstration that attracted up to 100,000 people. The opposition say they will stay until the resignation of the government and a crippling $1 billion bank scam is prosecuted. 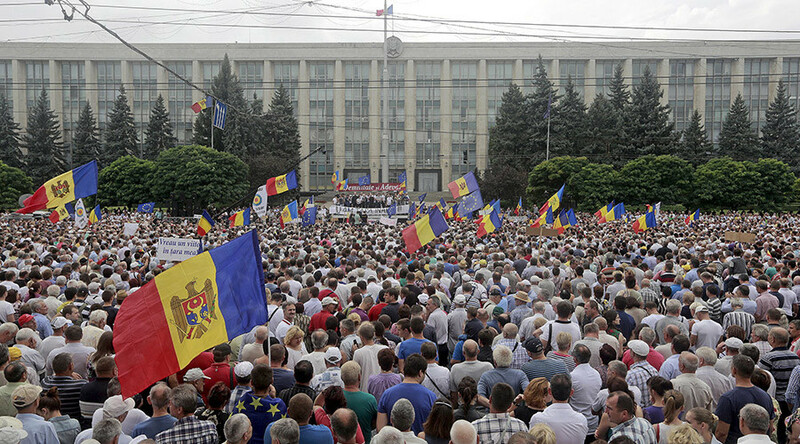 Organizers said that up to 100,000 people in a country which has a population of just over three million flooded the streets of Chisinau – the biggest demonstration since Moldova seceded from the Soviet Union. Many chanted “Shame!” and “Thieves!” The authorities estimated the number of protesters to stand at 40,000. While most of the demonstrators have been markedly peaceful, scuffles broke out at an offshoot picket outside the prosecutor’s office, as several protesters broke through a thin police cordon. Police say they have arrested a number of men concealing chains and other potential weapons in their backpacks. The authorities scheduled an open-air free concert with big-name Russian and Romanian pop stars to coincide with the protests, with local media reporting that some were paid upwards of $100,000 for participating. The protesters condemned the move as an extravagant bribe, and many of the local performers pulled out just hours before they were due to go on stage. Late on Sunday afternoon, the government accepted an official list of demands from the organizers, but refused their request to speak directly to the hostile crowd. Dignity and Truth says that not only must the top officials and parliament resign, but also that the constitutional system must change so that the president is chosen by direct ballot, rather than by members of parliament. 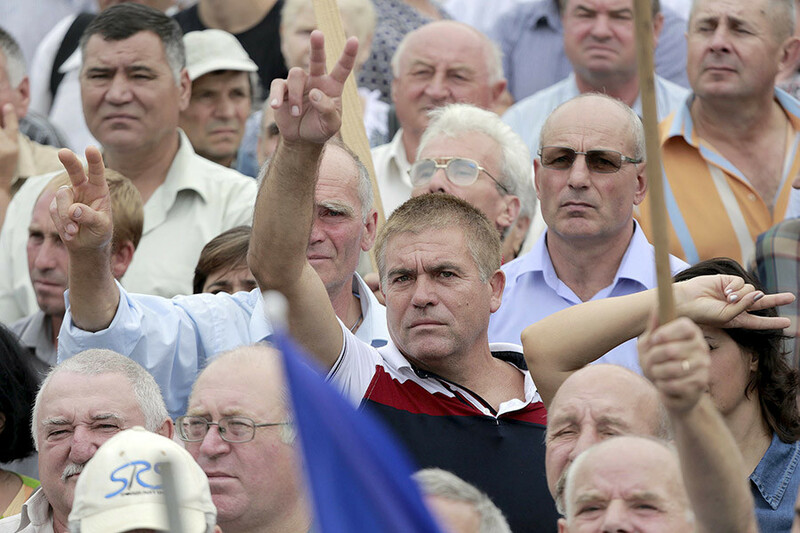 They have also called for the removal of “oligarchs” thought to be close to the levers of power. “This is not just a piece of paper, this is a howl of pain from our nation,” Stansislav Pavlovskiy, a former judge, and another leader of the protest movement, told the media. The petition has also asked for the punishment of those behind last year’s bank fraud that wiped out an estimated 1/8th of the country’s GDP. The scam devalued the local currency and has caused inflation in what is already the poorest country in Europe, with average wages of about $200 a month. International agency Kroll hired to investigate, pinned the blame for the crime on Ilan Shor, one of the country’s wealthiest men. With charges pending against him, Shor was elected as a mayor of a rural town two months ago. “We want to apologize before our citizens for the situation that has culminated in these protests,” Strelet said on Sunday, without saying how the government will respond to the cries from the street. 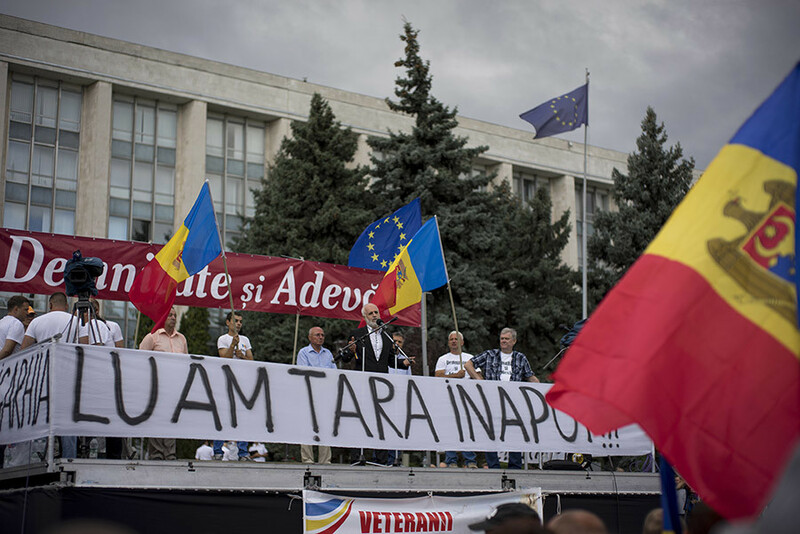 The opposition, who performed from a stage festooned with flags of the European Union, and Romania, an EU member with whom Moldova shares a language and ethnicity, say they are themselves in favor of closer ties with Europe, but claim these will not become reality until the removal of the current government. Romanian flags also outnumbered those of Moldova in the crowd. Dignity and Truth have also vehemently denied that they will form their own political party to take part in any elections if their demands are complied with, and say they have no affiliations with any of the country’s political or financial heavyweights, and receive no funding from abroad.